Are you looking for a yummy dessert for a summer gathering? I love very casual desserts for summer picnics and barbecues. 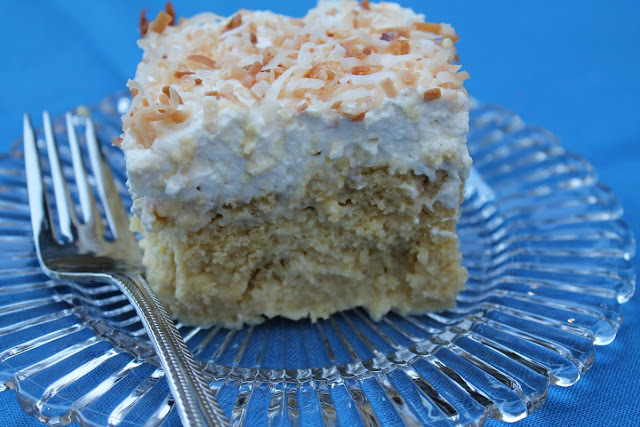 Poke cakes are a yummy, casual dessert that are always a hit at picnics and barbecues. 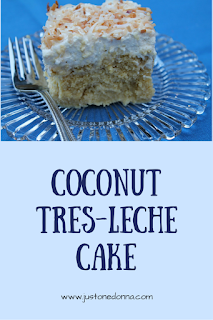 this coconut tres-leches cake is one of my favorites. Cool, creamy, and full of coconut flavor, a coconut tres-leche cake is perfect for the coconut lover in all of us. 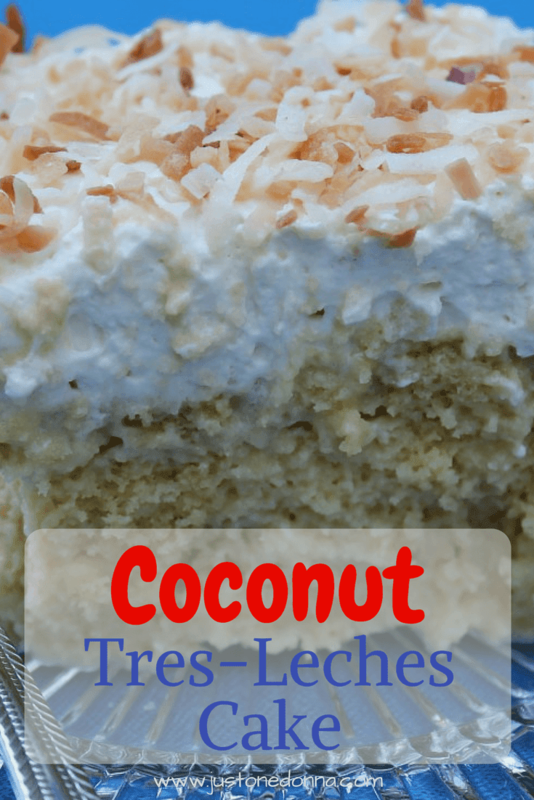 Best of all, this coconut tres-leche cake is semi-homemade. Start with a box cake mix, pour a mixture of cream of coconut, heavy cream, and evaporated milk over the cake, and then top the cake with fresh whipped cream and toasted coconut. There you have it. Easy and delicious! Be sure to make this cake the day before you want to serve it. This cake always tastes better when you let the flavors combine and allow the cake to absorb the various milks. I love the toasted coconut on top of the cake. It adds color and a little texture. You don't have to toast the coconut and you could even substitute with some fresh berries for a little color. Blueberries or raspberries would be great. Make the yellow cake the day before you want to serve it, following the directions on the box using a 9 x 13 rectangular pan. Cool the cake completely. In a blender, mix together the cream of coconut, heavy cream, evaporated milk, and vanilla. Pierce the cake all over with a fork or a wooden skewer. I like to use a wooden skewer. Pierce, pierce, pierce, and then pierce the cake some more. When you think you have pierced the cake enough, pierce it a bit more for good measure. 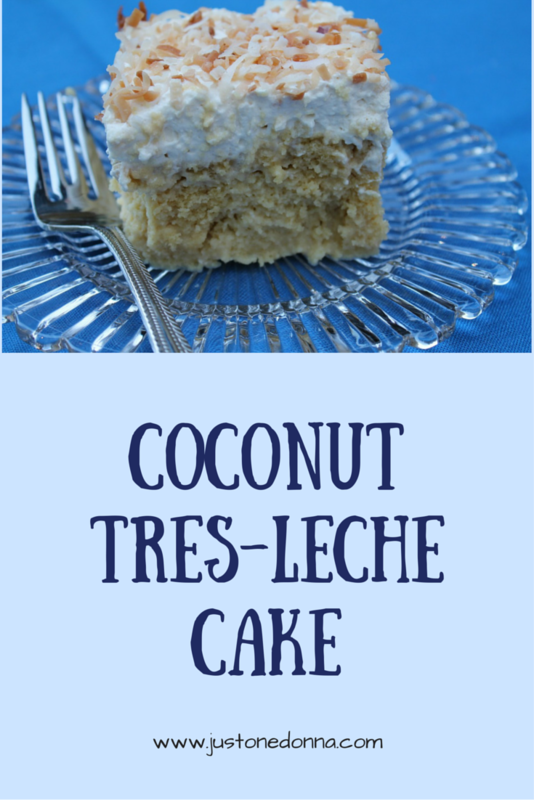 You are going to want the cream mixture to absorb into the cake and the holes really help. Spoon the cream mixture over the cake. Let the cream absorb in and then spoon some more over the cake. Take your time. I've made this cake many times and it comes out best when I am patient about spooning the cream mixture over the cake. When you are done with the cream mixture, it may not have all absorbed into the cake. That's OK. Cover the cake with plastic wrap and refrigerate it overnight. This will allow more time for the cream mixture to absorb. To make the toasted coconut, preheat your oven to 350 degrees F. Spread approximately 1/2 cup of the shredded coconut on a sheet pan. Place the pan on the center rack of the oven and toast the coconut until golden brown. Check the progress frequently because you don't want the coconut to burn. Set aside to cool completely. Just before serving, prepare the sweetened whipped cream. I make my whipped cream topping for this cake by beating together 2 cups of heavy cream, 4 tablespoons of powdered sugar and 1-1/2 teaspoons of vanilla. Whenever I am frosting a cake with whipped cream I stabilize the whipped cream by adding one teaspoon of unflavored gelatin per one cup of heavy cream, Sprinkle the powdered gelatin over the heavy cream and let it sit for about thirty seconds before beating. Then add the sugar and vanilla once the cream mixture starts to thicken. Spread the whipped cream over the cake. 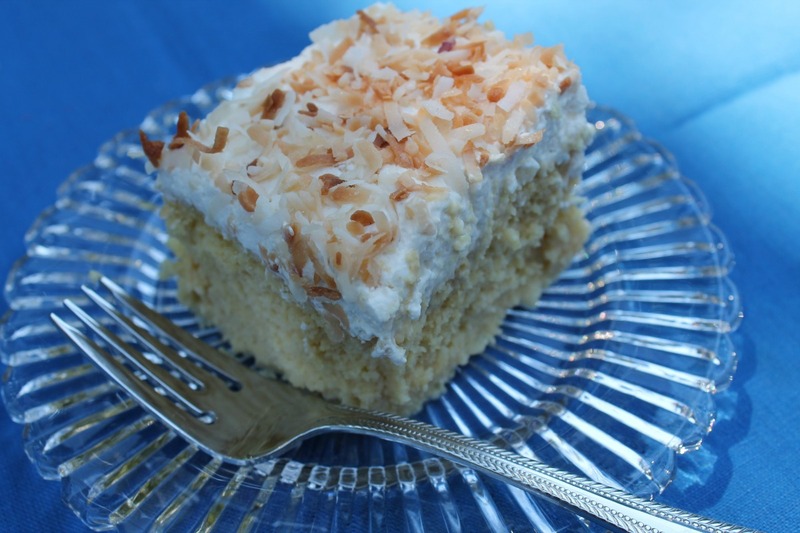 Sprinkle the toasted coconut over the cake. Refrigerate until serving. Looking for a different cake recipe? Try one of these.